Home / CRUISING THE PAST / RMS TITANIC 2 – Who is the villain in the COSTA CONCORDIA disaster? Carnival Corp (Micky Arison Israeli-American CEO) or the Captain? 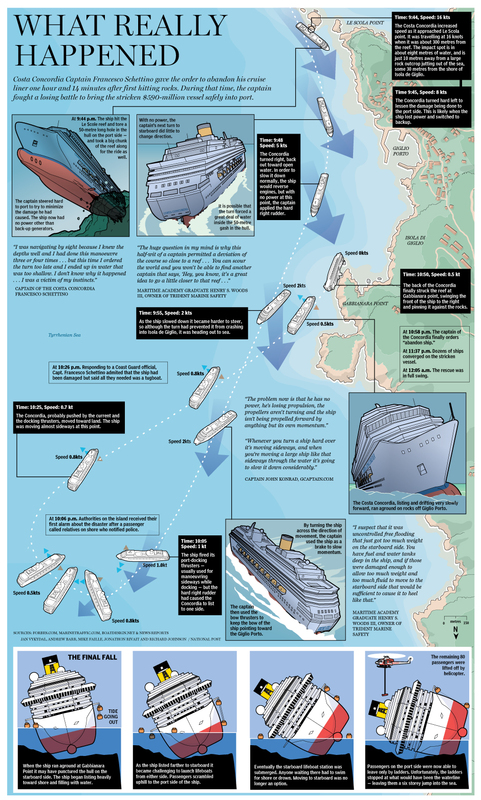 Cruise Ship History and Liner History: Who is the villain in the COSTA CONCORDIA disaster? Micky Arison’s Carnival Corp or the Captain? Are today’s mega-ships designed for safety? If this had happened in a rough sea, the Costa Concordia would have made the Titanic look like child’s play. New footage has emerged of the Costa Concordia’s captain on the bridge in the minutes after the ship hit a rock off the coast of the Italian island of Giglio. Seventeen people died and 15 are still missing after the ship capsized when an underwater reef tore a hole in its hull as it passed just 150 feet from the shore. Captain Francesco Schettino, 52, has been accused of altering the vessel’s course so he could show off to friends and crew. He is currently under investigation for multiple manslaughter, causing a shipwreck and abandoning the Costa Concordia when passengers were still on board. The 10 minutes of film, screened on Italian TV news channels, shows for the first time the reaction of the ship’s captain and crew as they dealt with the situation after several water-tight compartments on the 114,500-ton ship were breached. In the footage, a man identified as Mr Schettino can be seen speaking on the telephone in the half light of the bridge, illuminated only by emergency lights after the power failed on the liner with more than 4,000 passengers and crew on board. Despite the growing tilt of the ship, which later led to difficulty in lowering lifeboats, Mr Schettino still refused to give the order to abandon ship for a further 15 minutes. Prosecutors want to know why he waited more than an hour before ordering the ship to be abandoned off the coast of the island of Giglio. They are also questioning why he made a series of telephone calls to the ship’s owners, Costa Cruises, at their control room in Genoa and why he left the stricken ship when passengers and crew were still waiting to be saved. Chief investigator Francesco Verusio immediately ordered TV station TG5 to hand over the footage. The film shows several people on the bridge of the passenger liner and officials believe these include the Concordia’s purser and restaurant manager who were invited there by Mr Schettino. Captain Schettino is currently under house arrest near Naples. Dozens of additional survivors of the Costa Concordia shipwreck off Italy have joined a Florida lawsuit that accuses the ship’s owners of gross negligence and fraud, and asks for at least $528 million in damages. An amended lawsuit was filed on Tuesday in the state circuit court in Miami against Carnival Corp, which is incorporated in Panama and headquartered in Miami, and several of its subsidiaries, including Florida-based Costa Cruise Lines and Costa Crociere, which is based in Italy and operated the ill-fated ship. Thirty-three more surviving passengers were added to the six in the original lawsuit filed in January, bringing the total number of plaintiffs to 39. Carnival declined to comment, saying it does not typically comment on litigation matters. The lawsuit alleges that the company acted with gross negligence and careless disregard during the cruise that ended on Jan. 13 when the Costa Concordia hit a reef and capsized off the coast of Italy. The ship carried 4,200 passengers and crew, and 32 were killed. The suit alleges that the crew failed to conduct safety drills, that the ship was off course when it hit the reef, that the captain waited too long before giving the order to evacuate, that the crew performed badly during the evacuation and that the cruise line inflicted emotional distress and failed to provide prompt and adequate aid to survivors. “Plaintiffs found themselves in a listing, capsizing, sinking vessel without communication, direction or help from the captain and misdirection from the crew from approximately 9.45 pm to approximately 11pm and were left to fend for themselves,” the lawsuit said. Among those details were a requirement that claims against the company had to be pursued in Genoa, Italy, where Costa Crociere is based. “The nature of the conduct, being so outrageous and reckless, and the failure to provide for safety features, actually negates the contract… it makes the ticket null and void,” said Marc Jay Bern, a senior partner in one of the law firms that filed the suit, Napoli Bern Ripka Shkolnik and Associates. The suit said the captain’s abandonment of the ship before all the passengers were evacuated was “so outrageous in character and so extreme in degree as to go beyond all possible bounds of decency.” It asks for more than $78 million in compensatory damages and at least $450 million in punitive damages, plus interest and attorney costs. Costa, which blamed the captain for the accident, has offered passengers compensation of $14,500 plus a refund and costs of travel home. It had originally given passengers until Tuesday to accept the offer, but extended the deadline to March 31 to allow them to review the proposal with less urgency. Costa said the offer was available only to passengers who had returned home. The plaintiffs in the Miami lawsuit are from the United States, Italy, Venezuela, China, Canada, Germany, Korea and Kazakhstan. The lawsuit said the Florida court is the appropriate jurisdiction because the defendants engaged in business in the state. Next: French Line’s famous SS NORMANDIE in color films.